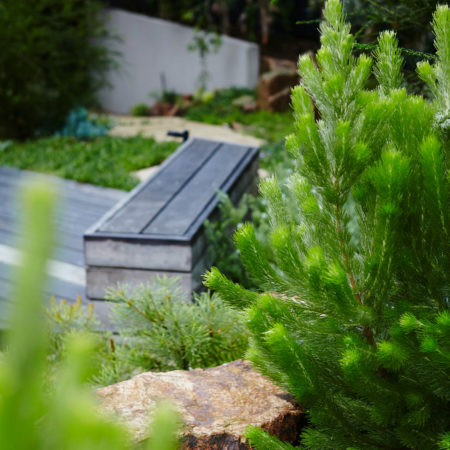 The beach house garden is located 30 mins south of Melbourne, Australia, in the breezy bay side suburb of Hampton overlooking Port Phillip Bay. 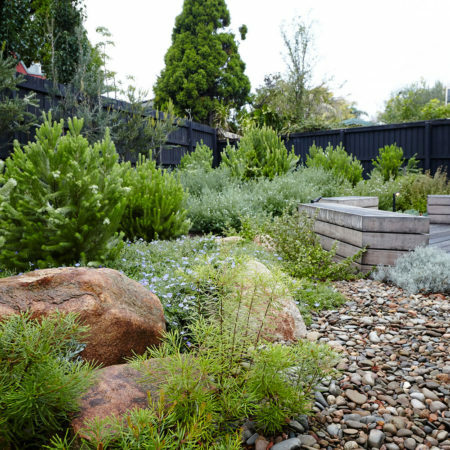 The existing garden had become overgrown and disused, occupied mostly by two pet dogs and a growing possum population. 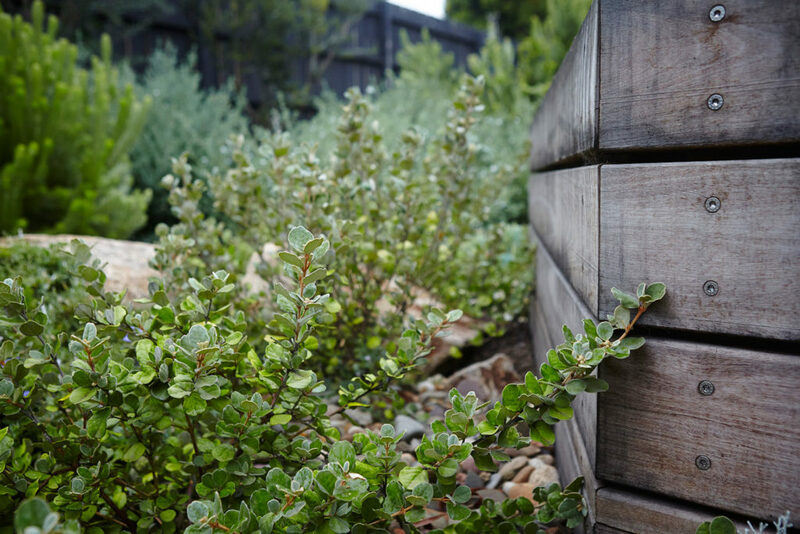 A giant Ficus hedge was a dominant element in the garden, dwarfing the space and causing a number of ongoing maintenance headaches. 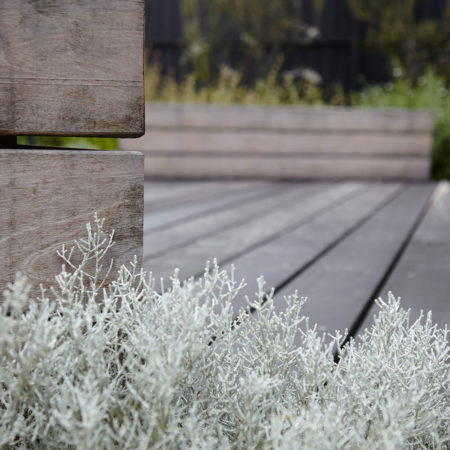 Other existing seating and paving elements had become tired, cracked and in need of upgrade to bring the garden back in line with the Architecturally designed house. 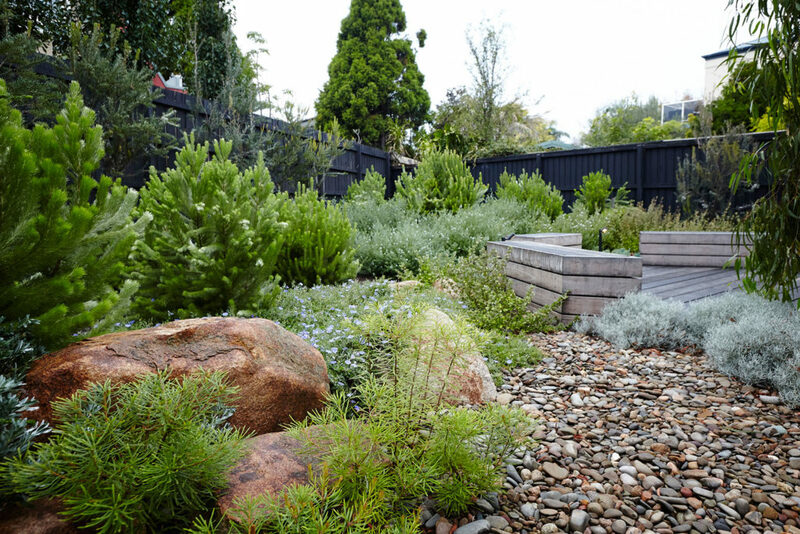 The client sought a complete overhaul, seeking to reclaim the garden and better utilise the significant space available in the garden. 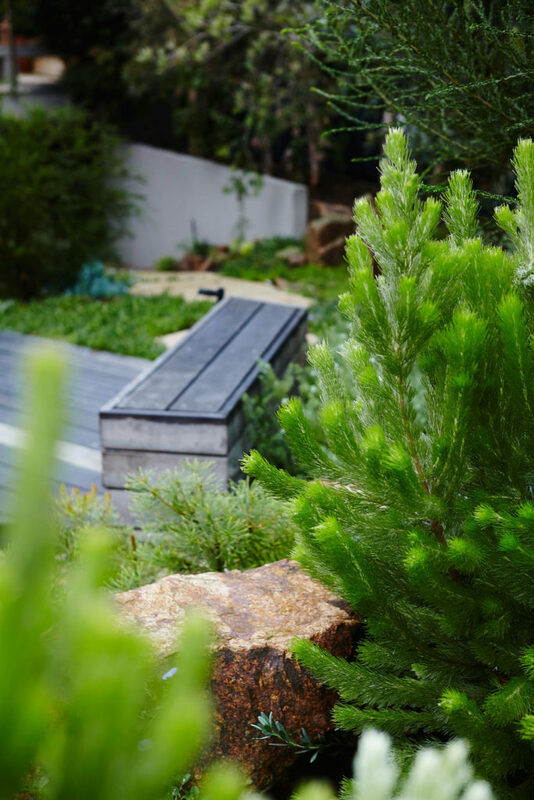 Our client is a local artist and painter who uses repeating patterns and geometry in her work, taking inspiration from the view from the plane window, high above sweeping landscapes and cities. 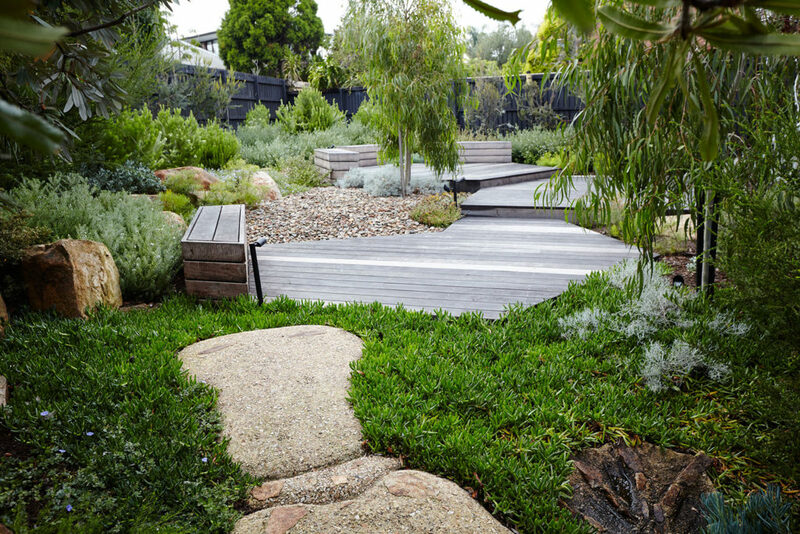 Her interest in geometric patterns and the need to revitalize the garden were the driving forces behind the project inception. 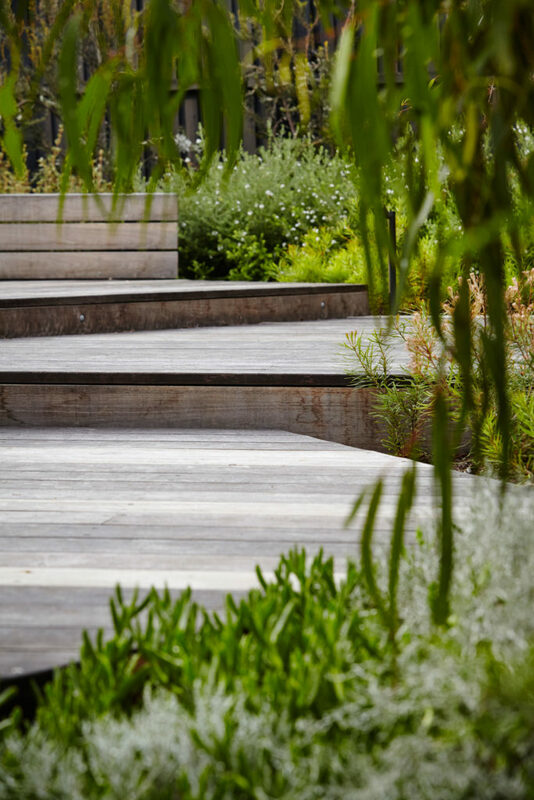 Taking inspiration from the client’s artwork, and following a detailed assessment of the site levels, the schematic design response was to create a new entertaining space, reclaiming the garden as a usable space and connecting the adjoining paths and access points. 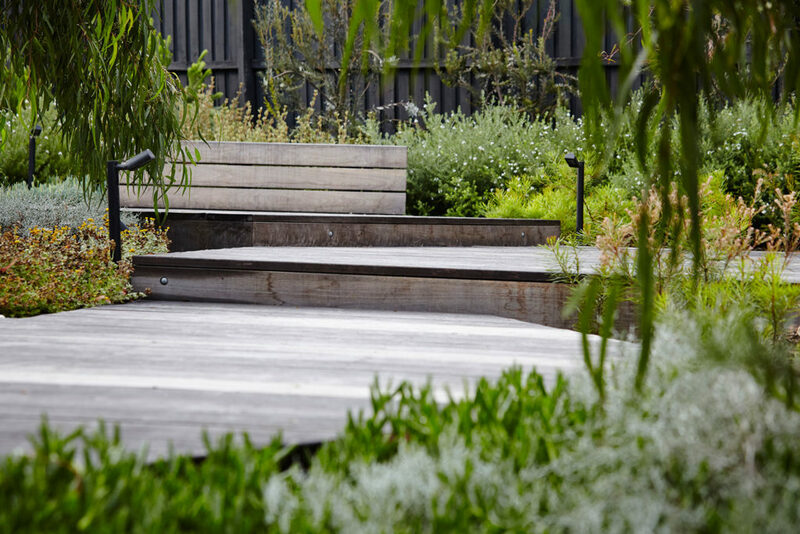 The garden design features a series of terraced, geometric timber decks and seating spaces. 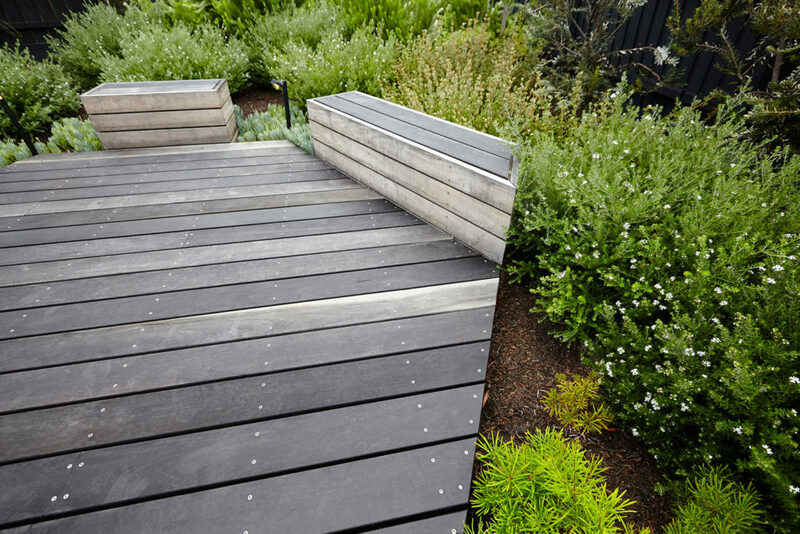 The material selection reference the heavy timbers used on nearby bayside walkways and trails, re-tasked to create a strong sculptural form. 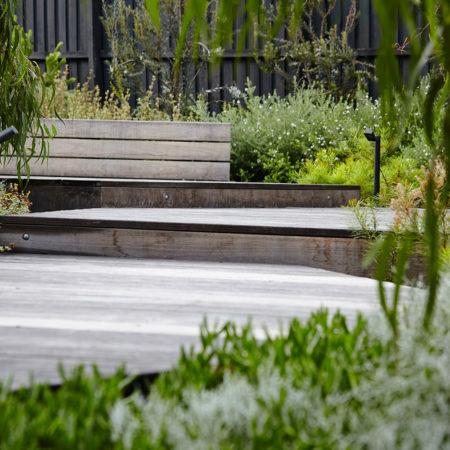 The extruded seating forms emphasize the hexagonal geometry and provide much needed rest and relaxation opportunity, catching the afternoon sunshine and casting shadows across the deck. 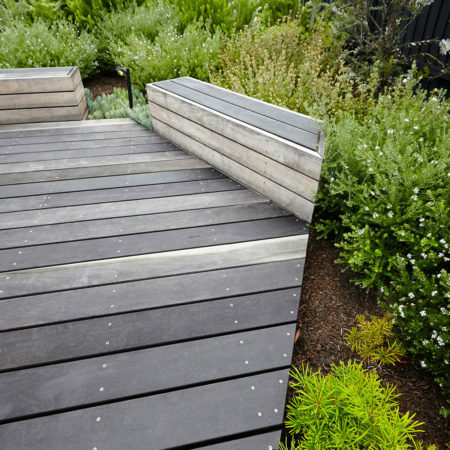 The level transition across the garden is resolved simply through the creation of three gently rising deck platforms which link the structure to adjoining steps and paths. 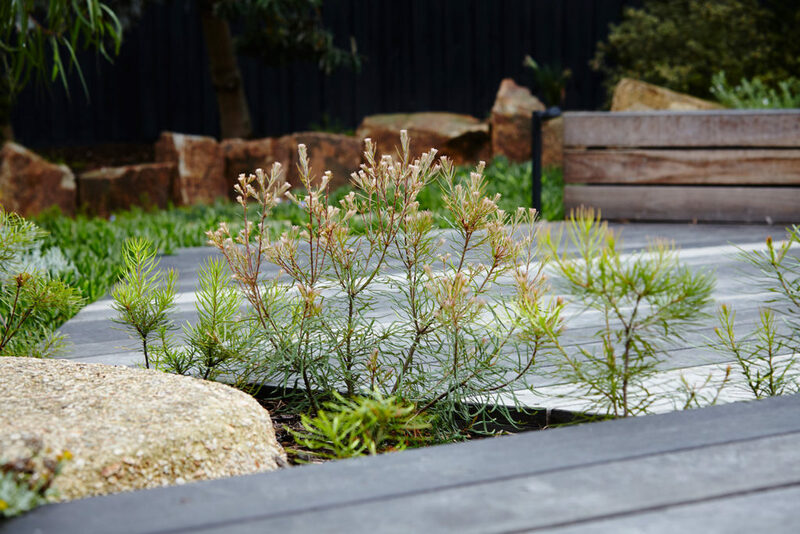 The balance of the garden was cleared of weeds, cultivated and replanted utilizing a palette of indigenous and native coastal garden species which better suit the tough conditions, coastal soils and attract local bird life into the garden. 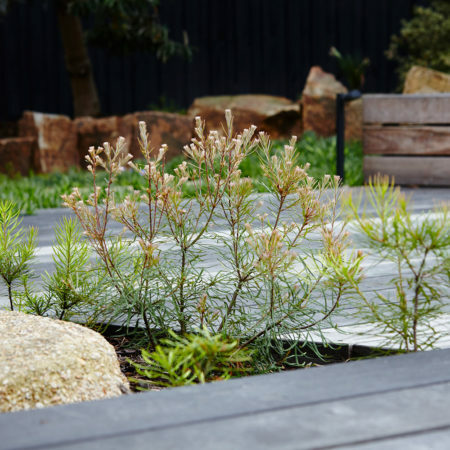 New native trees were selected for their flowering displays, eucalyptus scent and bark texture and placed in the nooks of the deck to create a playful relationship between the deck and planting. 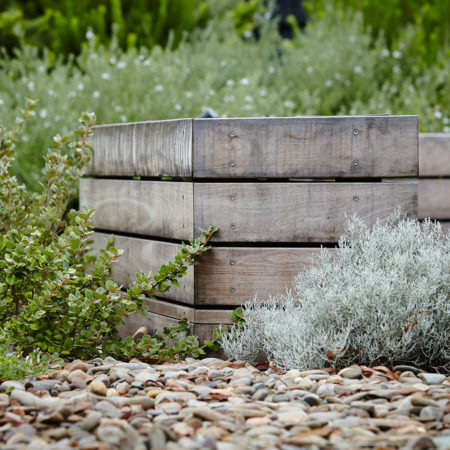 A clear space was established in the centre as a dry, arid garden feature, displaying a natural rockery and a bed of river pebbles to provide a striking textural contrast with the natural timbers. 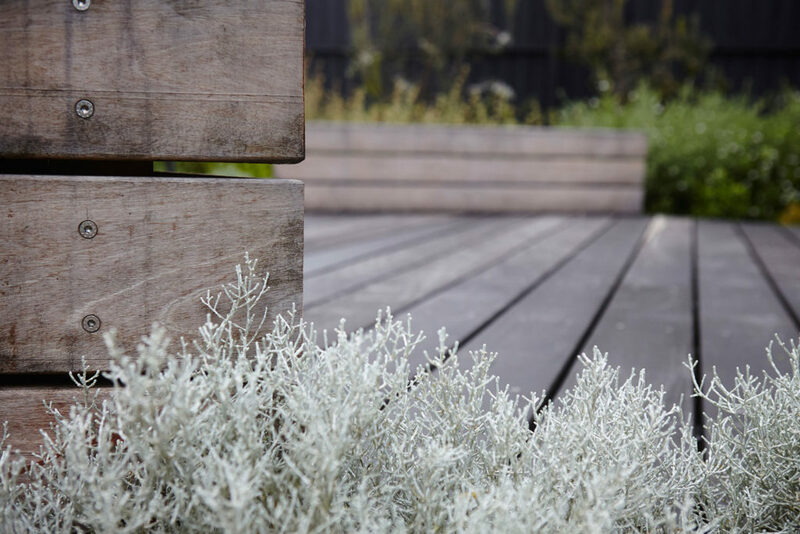 Simple, low key lighting fittings provide accent to the decking steps and trees to create a relaxing, easy going coastal vibe in the summer evenings. 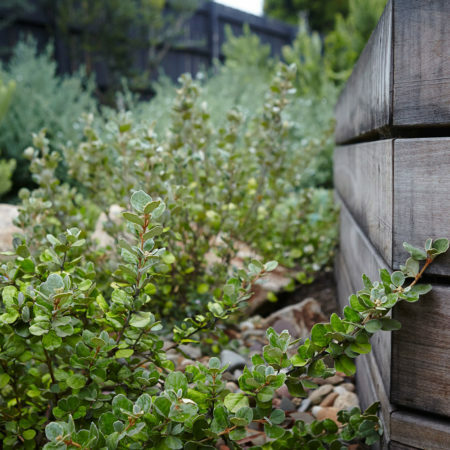 The final outcome saw the transformation of the rear garden from a disused backyard into a high-end entertainment space set within a native garden sanctuary, all immersed in native coastal vegetation. 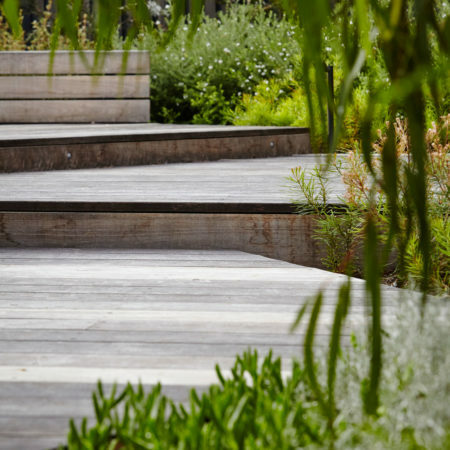 The high build quality and fine detailing was a feature of the project and stemmed from thorough design documentation and good working relationships with the landscape contractor. 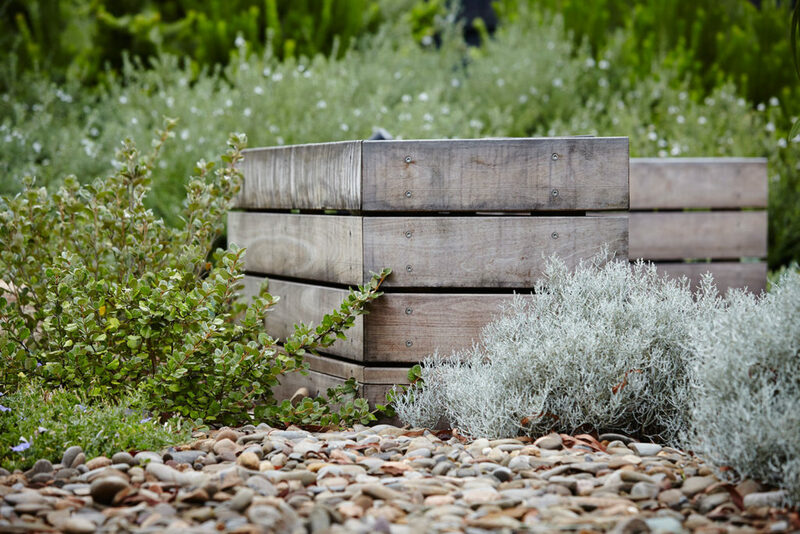 Papworth Davies project managed the complete process from inception and provided concept design, detailed design and contract administration services for the project.